This year was the 13th running of Ukrop's Monument Avenue 10K and although it was my first time participating in this event, it certainly will not be my last. This race really only came onto my radar in mid-February as I began looking ahead at my spring race schedule and noticing a void between the Yuengling Shamrock Marathon in mid-March and The North Face Endurance Challenge in early June. 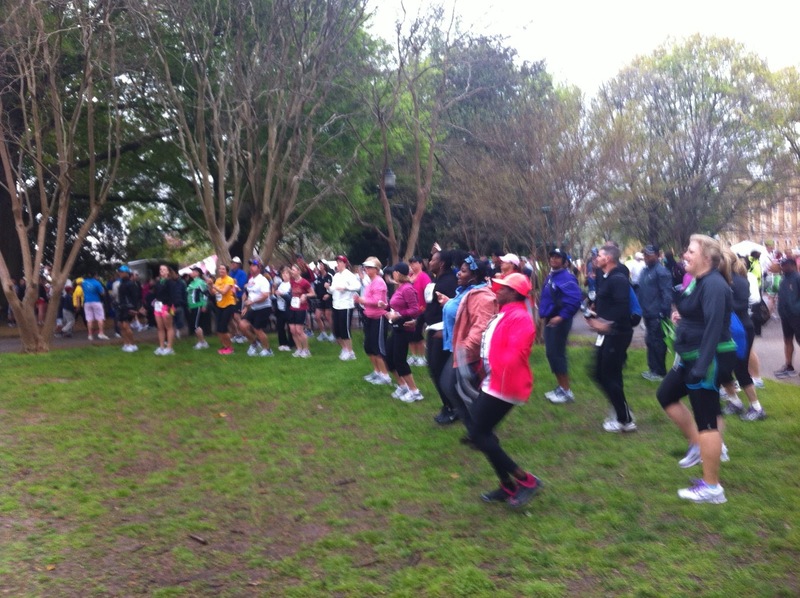 I found an article on BlueRidgeOutdoors about great races for beginners, at the top of the article was a picture of thousands of runners filling a tree canopied street, it was the Monument Avenue 10K, and I was sold. I convinced Michelle to join me and ran the idea by my aunt in uncle in Richmond to see if we could crash there for the weekend, soon it was a family affair, we even persuaded my parents to sign up. 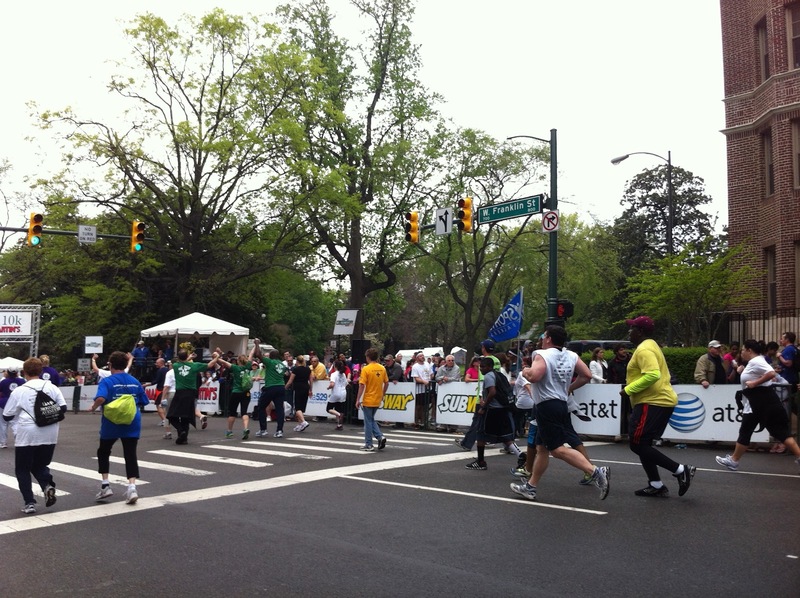 Unknown to me at the time of registering for the Monument Avenue 10K was how poorly I'd fair at the Yuengling Shamrock Marathon just two weeks earlier. Cramping forced me to walk/jog the last 6 miles of the race and after recovering left only 10 days between the two events that I could actually run. I only managed four runs between the two events and didn't really know how I would react to trying to push for a PR in the race, but I was confident that I would carry some of my fitness from the marathon into the race and was willing to give my best effort. The race weekend began by taking a half-day on Friday at work to avoid the mess that is always Lake Norman I-77 Northbound, putting me in Radford, VA to pick up Michelle a little before 4PM. 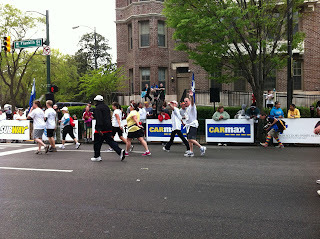 It was like deja vu having just done the same drive two weeks before for the marathon. We got on the road a little before five and quickly made a stop at Jimmy Johns for a couple number 9's (Italian Night Club), (maybe their 'Freaky Fast' rubbed off on Michelle and I) **note for future runs**, fast forward four hours and we were in Richmond just before 9PM. We hung out with my family and enjoyed a second dinner while figuring out the details for the next day, what time we were leaving, what waves everyone was in, etc. before calling it a night around 10:30. The next morning after multiple snoozes of Michelle's alarm I finally dragged myself out of bed to get ready for the run, I pinned my bib and pushed away any breakfast that was offered, as I had no desire to eat but did enjoy having some coffee that was already made, the best kind. 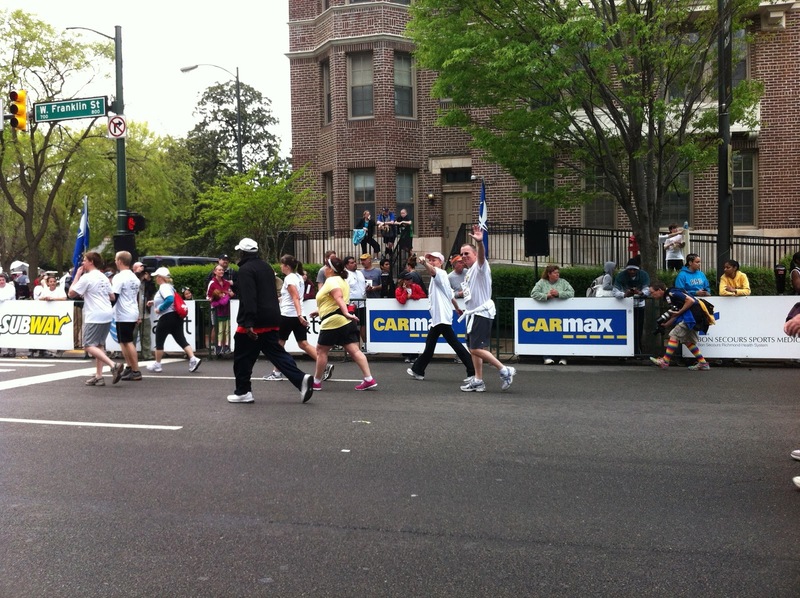 Now up until this point, I have neglected to mention the main reason I was interested in the Monument Avenue 10K, the 40,000+ runners that participate in the race. This small detail becomes a factor when figuring out when to arrive in downtown Richmond as I was in the seeded coral B (8:33AM), Michelle in another (9:03AM), and everyone else in a much later wave (10:12). The really neat part about this is that everyone had an opportunity to see each other run, as I was finished around 9:15 and was able to see Michelle finish just before 10 and everyone else around 11:30. This also meant that everyone who wasn't running in my 8:33AM wave had a TON of time to kill in the morning including me, as we arrived around 7:30, so we took part in all the events there in Monroe Park. Michelle and I before the race. 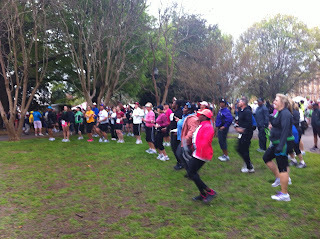 Since most runners arrived early to find parking, there was plenty of time to pass, above the runners were dancing. Since Michelle and I traveled Friday afternoon we had everyone else pick up our race bibs and packets, which also meant we missed the expo, I was looking forward to expo because the Brooks Run Happy Cavalcade of Curiosities was there. 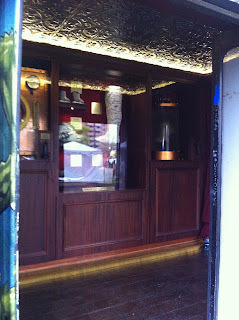 What is the Brooks Run Happy Cavalcade of Curiosities you ask? 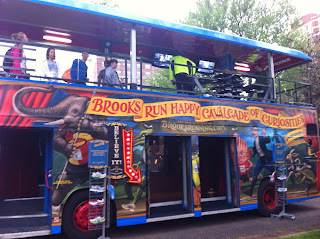 The pictures below don't do it justice, but basically a double-decker bus that was turned into a mobile Brooks store complete with treadmills for running analysis and some other neat museum type stuff on the first level. Here's a link to the Brooks Gallery of the bus as it was being made, pretty neat. The Brooks Run Happy Cavalcade of Curiosities. Another awesome note is that most of us walked away with cool swag from the Brooks tent including two shirts, two hats, and my dad was even lucky enough to win a free pair of shoes! I wanted to see what they had to say and decided that I could use my quick jog on the treadmill as a warm-up for the run, so with less than 20 minutes before my wave started I had my running analyzed. I thought it was neat how iPads were integrated into the experience including signing in to put your name on the list, completing the waiver, and sending the images of your run with measurements and shoe recommendations to your email, all while you stand there. Afterward, I made my way over to the start just in time as the first wave, AA (Pro's/Elites), was leaving as I was arriving. I hopped over the barrier and placed myself around the middle of the coral, waited a few minutes and we were off. Wow! I knew the pace was going to be quick, but unlike most marathons or other big races where you start and everyone jogs and then slows down as you inch over the timer starting pad, this was not the case as it was zero to 7min/mi quickly (the seed time for my coral was 43-45minutes and required providing a hyperlink to results within the past 12 months of a time that qualified). I found a guy who looked comfortable and latched on to him as my legs were not used to the quick pace and knew if I could get over the initial shock in HR level I would be able to maintain the effort for the race. I stayed behind him for a couple miles, before we ran side by side and he eventually faded away. 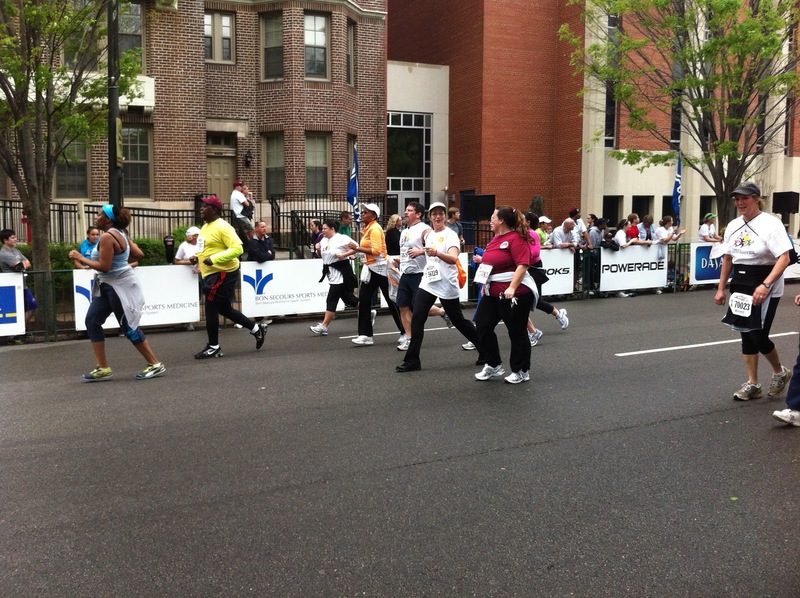 The volunteers, bands, and locals were out in full force and made the race really special. Around mile 3 we hit the turnaround where you can see the halfway 5K(3.1mi) sign as you exit the turn. I really enjoyed the distance of this race as it wasn't long enough for my mind to wander and become bored, this also may be attributed to the fact that I was running a pace much faster then usual and had to focus to avoid blowing up. Right around the 3.5 mile marker you begin a slow gradual downhill to the finish and I was doing all I could to focus on individual miles and maintain a ~7:00ish pace. The only place I faltered was mile 5 where I ran a 6:52 after a 6:48 for the fourth mile. The goal is to either maintain pace or negative split, meaning decreasing your pace/mile for every mile. With 3/4 of a mile left I was on the verge of losing the breakfast I didn't eat and at this point I'm glad I didn't or it would have been all over Monument Avenue. I'm still waiting for the race when my finish photo is me dry heaving with my face contorted or even worse, a photo finish upchuck! My aunt took this photo of me into the finish. Thanks Juls! I crossed the finish line in 43:15, a new PR by exactly a minute, my previous best was 44:15 at the 2011 Ashburn Farm Turkey Trot 10K. I was pleased with my time and average of 6:53/mile for 6.2 miles, but know that I have the potential to run sub 42. 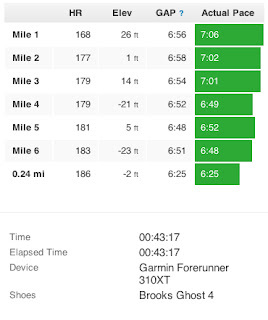 I was happy to negative split all but the fifth mile, think it shows I ran the race well and to my limits. The peak heart rate recorded was 188, which I believe as the data shows a steady increase to the finish with smooth data capture. Really feel I left it all out there, well all but the contents of my stomach. I wandered my way through the finish shoot gathering bottles of water before heading over to where all the food was, my only complaint of the run, was the food provided after. The food wasn't bad it was just nothing special and included rolls, bananas, Powerade, and Apples which I enjoyed two of. My grandmother said she saw me on TV, but with forty-thousand plus runners, it could have easily been another runner but she was right. I watched the footage of the race last night and found my 3 seconds of fame, on local news that is! I'm on from 7:31 through 7:34. Eventually I found the rest of my family and we walked around Monroe park before heading back to Monument Avenue to watch Michelle finish. She did great, running a new PR of 57:18, I'm very proud. The rest of the morning consisted of walking around downtown Richmond trying to locate the car while the others were out on the course, eventually this would become a pretty funny joke, as the group failed to mention they parked in a garage not a parking lot and that the car was on the second floor. Michelle and I found a Panera and Chipotle, the perfect combination in my opinion, especially since Chipotle gave me free chips and salsa for checking in on FourSquare (I was also their first customer of the day). EDIT: Found these photos from the race. After the finish they had banners set up taking photos. Is it just me, or does the guy behind me look like a famous cyclist? Ha, I wish! 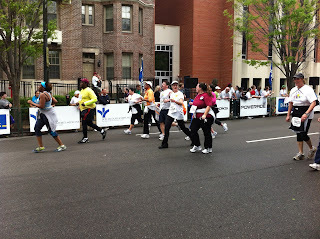 This was about 2 miles into the race, not really sure what is happening next to me. 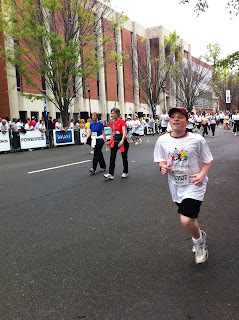 Finally, we headed back to Monument Avenue to watch my aunt and uncle, cousin, and parents finish. It was a fantastic family event and I love how running has brought our family together enjoying something healthy and productive. My uncle Steve heading into the finish. My parents at the finish. It was a fantastic race and I know we will be back next year, assuming it doesn't coincide with the Cherry Blossom 10 miler as I really want to do that run as well, if it does, maybe it'll be a double weekend! 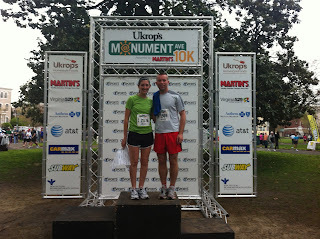 Posted by Unknown at 7:59 PM , Links to this post , 0 comments I'm reading from MyDailyGround: Ukrop's Monument Avenue 10K Race Report Tweet this!